Mapping the route to the circular city. Several cities have joined forces to chart their path to a future where they will create no waste and everything will be reused or recycled endlessly. Believe it or not, there is money in this, and it has a name: the closed loop economy. By 2050, 75 per cent of the world’s population will live in cities and their rapid growth is putting enormous pressure on resources, carrying capacities, and quality of life. Cities already produce half of global waste and 60-80 per cent of greenhouse gas emissions. Land and buildings are also under-utilised in cities. For example, in the UK alone there are 700,000 empty homes – 22,000 in London alone. Circularity in resource flows is a way of reducing the consumption of resources, such as energy, water, buildings and land in cities. Cities have a great catalytic power to develop new economic models that make the most of what they have. City leaders are increasingly being challenged to rethink the way our current urban systems operate, to learn from previous mistakes and implement these lessons in building future systems. Doing so by paying attention to resource flows will help to build long-term prosperity, resource self-sufficiency, economic viability and human wellbeing. There are other benefits too: encouraging cooperative behaviour, localisation, economic activity and jobs resulting from recycling and remanufacturing, systems integration, flexibility and intelligence. These are the exciting, revolutionary ideas under-pinning the idea of the Circular City. Just as 20th century cities developed sewage systems to prevent human waste from flowing down the streets, 21st century cities are developing systems that make use of this valuable resource – and every other kind of waste – instead of throwing it away and causing pollution. Dame Ellen MacArthur, who first made her name as the world’s greatest solo long-distance yachtswoman, has reinvented herself as a pioneer of the closed-loop economy and founded a foundation in her name to spread best practice and new ideas. In October, her foundation hosted the launch event of its Circular Cities Network. This global network consists of city leaders who are pioneering the application of circular economy approaches. Nine cities are the founder members: Austin, Boulder, Copenhagen, London, Ljubljana, New York City, Peterborough, Phoenix and Rio de Janeiro. So far the network is providing an online knowledge exchange platform to support decision-makers from city authorities to take action. They will meet quarterly via video conference and receive a free quarterly webinar series on circular cities innovation produced in collaboration with University College London, which in September launched a Circular Cities Research Hub. Network members are working on projects in areas ranging from the built environment and consumer attitudes to everyday equipment, consumer goods and furnishing, financing models, ICT, policy, remanufacturing and design. The foundation also runs a CE100 Acceleration Workshop twice a year for companies, which helps them with cross-company and cross-sector collaboration. The Circular Cities Research Hub at UCL is building on the visionary ideas first developed by Herbert Giradet in his books Ecopolis, Regenerative City and Self-Sufficient City, by linking them to the ideas of the circular economy, shared economy, low carbon cities and smart cities. Urban ecosystem services: design, valuation, physical impact of nature-based solutions. Anyone interested in these areas is encouraged to get in touch. 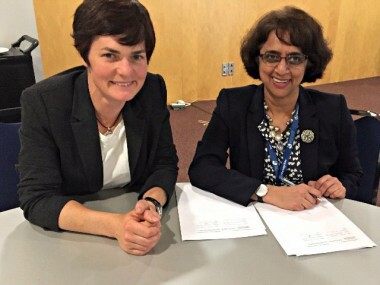 Dame Ellen MacArthur (left) with Dr Siva Kumari at the signing of an educational partnership with the International Baccalaureate. 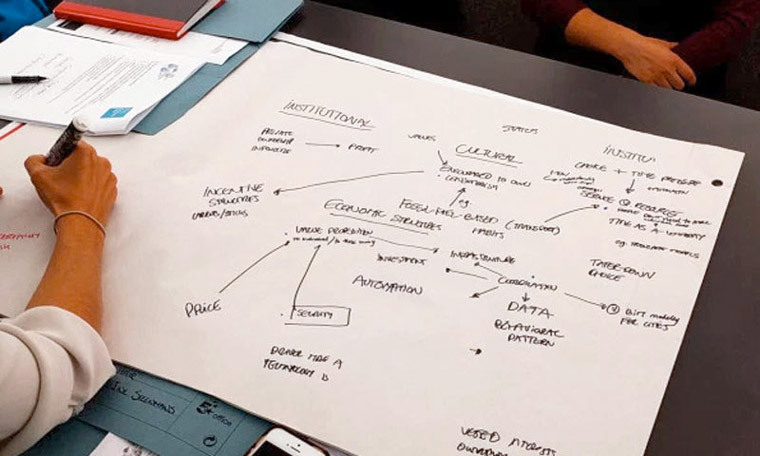 UCL understands that the next generation needs to be educated in the principles of the circular economy, that we can start even younger than postgraduate level, and to this end the International Baccalaureate has begun a collaboration with the Ellen MacArthur Foundation to embed systems thinking and a circular economy perspective into its curriculum. This will provide teachers and students with classroom resources that link circular economy and systems thinking to students’ curriculum learning. For example, the new 2017 Diploma Programme geography course will feature specific references to the circular economy. Ellen MacArthur and the folks at UCL are not the only people working to spread ideas about the circular economy. In Berlin, Germany, Green Alley is a start-up hub of Landbell AG, a company that designs and manufactures take-back systems. It runs an awards scheme that recognises the best green start-ups and innovative entrepreneurs, and last month it bestowed its awards for the third year running. These awards recognise new business models for start-ups that can support and accelerate the circular transition in the economy at large. There were 191 entries from 52 different countries received – almost double the previous year’s figures. Das Tiffin Projekt (Germany): sustainable take-away packaging: transporting take-away meals in stainless steel boxes – consumers get their meals in the steel boxes, after which they get to keep the box up until seven days before returning to any of the partner restaurants. Design by Sol (UK): a food expiry label that is able to give a more accurate estimation of the edibility of our food – layered with gelatine, if it swells up, the consumer should not consume the product anymore. Glowee (France): Glowee creates bioluminescence, meaning that the start-up produces light by using micro-organisms and methods extracted from nature. The unique lighting technology will soon illuminate shopping windows, but in the future it is possible that it will also light our cities. ResQ Club (Finland): an app saving food waste from restaurants: leftovers are sold at reduced rates and consumers can buy quality food at a much cheaper price. restado (Germany): a digital marketplace for leftover construction materials; they can be sold in smaller quantities that are cheaper and better suited for the home DIY builder. 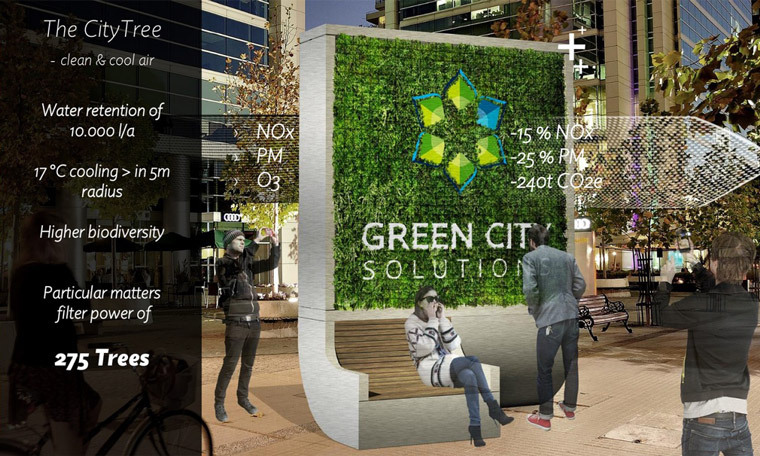 Green City Solutions’ urban moss installation was chosen as the overall winner for its ability to be replicated widely and easily throughout the world to tackle urban air pollution, which is an acute problem in many cities. Its product, the CityTree, consists of moss cultures that filter the air to make it cleaner. It is powered by solar panels, has a water collection system and is internet-connected, requiring only a minimum amount of maintenance during the year. It claims that the moss growing on the installation can absorb as much carbon dioxide as 275 trees. It also reduces particulate matter and NOx molecules produced by vehicles. The CityTree also monitors the air quality and reports on improvements, while its NFC/iBeacon technology enables wireless and location-based advertising opportunities for business partners to provide a channel for financing. The CityTree has a reach of up to 50 metres, with 1682 single slots individually controlled and supplied with nutrition, water and salt, which allows for optimal vitality and structure of the moss-plant combinations. One of the most difficult materials to build into a circular economy is plastic. But, also in Berlin, SYSTEMIQ, an advisory, business building and investment company, has collaborated with the Ellen MacArthur Foundation on the New Plastics Economy initiative consisting of 40 leading companies, including Coca-Cola and Veolia, and cities like Copenhagen and the London Waste and Recycling Board. Its new research on the topic is for publication later this month. SYSTEMIQ’s business is to identify and create opportunities for system-level impact across energy, food and land use, the circular economy and the built environment. The New Plastics Economy is an ambitious, three-year initiative to build momentum towards a plastics system that works. Applying the principles of the circular economy, the initiative brings together key stakeholders to rethink and redesign the future of plastics, starting with packaging. Amongst its aims is the design of a Global Plastics Protocol. This will be a common target for companies to innovate towards, that will overcome the existing fragmentation of plastic types and industrial processes in order to enable the creation of effective markets for recycling plastics. No one should underestimate the task of converting the present linear system of resource extraction, manufacturing, consumption and dumping to the circular one. But it is inspiring to know that so many people people and cities are already coming around. A prerequisite for the circular economy to be implemented safely requires chemical additives to be non-toxic and/ or benign. Currently recycling (resource recovery) initiatives resulting in recycling inputs for paper, carpet, plastics, etc contain fluoro chemicals, flame retardants, and a plethora of other additives, modifiers and agents which piggy back into new products. Some of these chemicals are even finding their way into the food chain. Does the Global Plastics Protocol intend to have governments review laws requiring certain chemicals to be restricted as inputs or use to avoid being inadvertantly piggy backing into the circular economy?